I realize these are great numbers so I'm not looking for validation, but where is likely to get me the most money based on other people's experiences. I am a division one basketball player, with a long list of other extracurriculars/volunteer work and leadership positions, but no actual job experience. I'm applying to a wide range of schools on purpose (I realize that several are not highly ranked): Stanford, University of Notre Dame, Georgetown, University of Washington, Villanova, Santa Clara University, and might throw an Ivy or two on there just to see if I can get in. Also, I've heard different advice to either go to the best school you can get into, regardless of money, or to go to the one that makes the most financial sense, so any insight here would be appreciated! 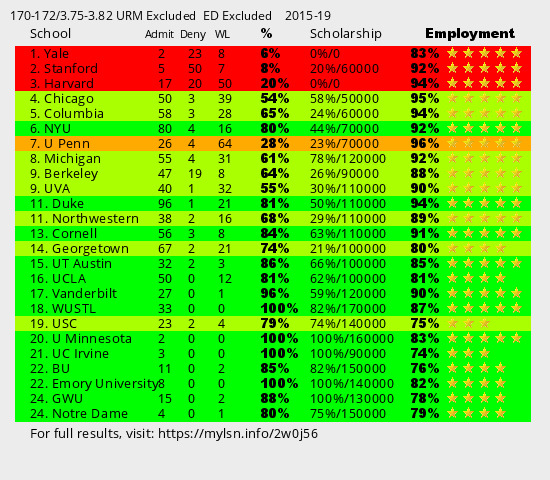 You should apply to the best 25 schools in the country. If you don't get in, reapply next year with updated application materials. Go to the best school you are accepted. Hire a scholarship negotiator. Worked well for me (3.9, 168). I was offered several $100k+ scholarships at top 13 schools. Your credentials are possibly better than mine. Don't settle. pointplace wrote: You should apply to the best 25 schools in the country. If you don't get in, reapply next year with updated application materials. Go to the best school you are accepted. Hire a scholarship negotiator. Worked well for me (3.9, 168). I was offered several $100k+ scholarships at top 13 schools. Your credentials are possibly better than mine. Don't settle. Thanks so much! If you don't mind, which schools gave you those scholarships? I was given scholarships (ranging from $60k - $150k) at U Chicago, Penn, Duke, Berkeley, and Northwestern. I only applied to the top 13 schools. You don't need a scholarship negotiator. A 3.9, 168 is naturally going to get 100k scholarships because they exceed one #, and hit the median of another. The only way you'd need a scholarship negotiator with those numbers is if your PS is about your commitment to the alt-right movement, a love of crystal meth or something similarly weird. You will get into a lot of t-14's with those #'s, and a non-weirdo application. Ugh. Why would OP apply to the 25 best school in the country? That simply makes no sense. Here's what OP can expect from the top 25 schools. They have a very low chance at Y/S so, absent a fee waiver, why expend the time and pay the money to apply? H is probably worth an application, particularly if OPs financial background is likely to result in a decent amount of need based aid. Below that, OP can expect a number of schools in the T-14 to offer scholarship packages in the $120k range. Dropping lower is likely to result in, maybe, $50k more in scholarship in return for attending a school with markedly worse career prospects together with what is likely a smaller faculty, fewer rockstar professors, and possibly regional employment reach. Some of those schools might have specific criteria that appeal to OP and their career goals, but applying to all 25 schools is, in my opinion, a needless waste of time and energy both for OP and for the adcomms reading their application. OP here, thank you all for your insights! I think 25 schools is a few too many for me to realistically afford to apply to, but I am considering adding Harvard and some other T14 schools. Shelby wrote: OP here, thank you all for your insights! I think 25 schools is a few too many for me to realistically afford to apply to, but I am considering adding Harvard and some other T14 schools. Agree that there is no good reason for you to apply to 25 schools, but I'd strongly urge you to apply to all of the T13, starting at CCN and down. As you can see from albanach's post, you have an excellent shot at the T13, with an excellent chance of getting substantial $ at one or more. I urge you not to run the risk of missing out on a great admission/scholly offer due to an attempt to save a few hundred bucks on application fees. With your numbers, blanketing the schools ranked 4-13 is a wise investment in your future.